It is these stories that I like to write down for Éowyn in a journal that I have dedicated to her. 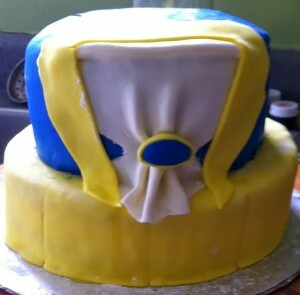 I will talk more about that another time but for now I want to show you my first attempt ever at making a fondant cake. I am extremely proud for my first attempt. I did make a practice cake the week previous but did not go into too much detail. So I guess the final cake is my second attempt? I actually preferred the look of the Beast’s jacket on my first practice run but oh well, with me making the cake on my birthday and getting all the food ready the day of her birthday I have a busy couple of days there. I wanted to do a practice run because I have never made fondant, let alone worked with it. Nothing worse than trying something new the day before your daughter’s birthday, hoping that the cake will turn out! That was my reasoning for the trial run. I took the cake out of the fridge a couple of hours before the party to try and get the sweating process out of the way but it continued to do so throughout the day. I need to do some research on how to prevent sweating. I had to keep the cake in the fridge because I made a mousse filling and did not want to risk the cream going bad on the counter overnight. No need to poison all my guests! Of course Éowyn, being the mischievous child that she is, got to her cake before any of the guests showed up! I hadn’t even taken pictures yet so she motivated me on the spot. That is why all the pictures are taken from the “good” side. 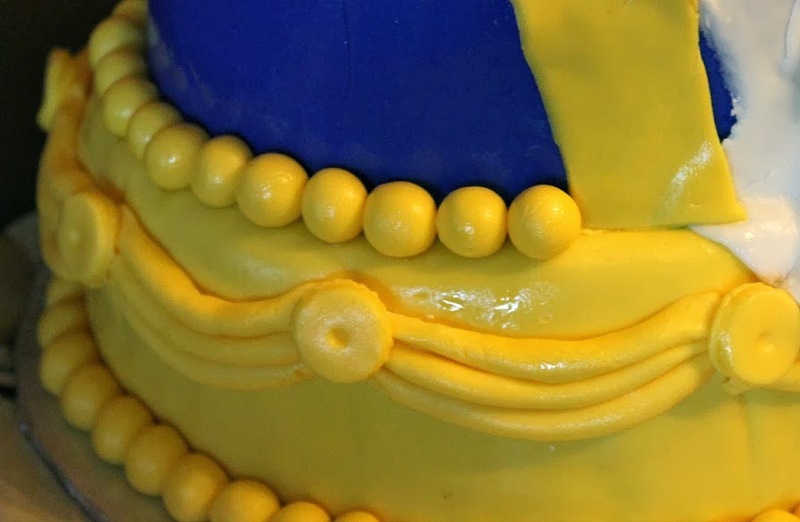 How did I go about making the cake? 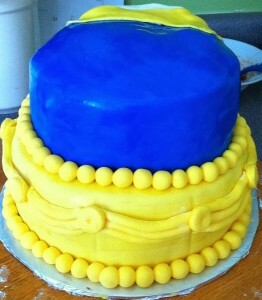 I used the marshmallow fondant recipe from allrecipes.ca. The first time I used the technique I followed the instructions to a letter, however the fondant was hard on my kitchen aid mixer let me tell you. The second time I just poured an icing sugar mountain on my countertop and poured the melted marshmallow into the sugar. Much easier mixing it by hand and I found my consistency was better. I will post a tutorial on how to make fondant in the future. How do you store fondant? 1) Since fondant is not made up of anything perishable, the fondant should keep as long as the expiry date on your bag of marshmallows. 2) If you keep the fondant in the fridge, wrap it tightly so it does not take on the odours from your fridge. Take out the fondant a couple of hours before use because the balls will be hard to the touch. 3) If you find the fondant too hard, heat SHORTLY (I am talking 5 second intervals) in the microwave until you reach your desired softness. 5) The recipe above I found that I did not need all the icing sugar so start with a specific amount and add more when needed. If you add too much sugar the fondant will dry out and be brittle, leading to cracks and breaks when you roll it. 6) You do not need one of those fancy silicone fondant rollers.I used my wooden roller pin and it worked extremely well. Maybe I am just more comfortable with that. 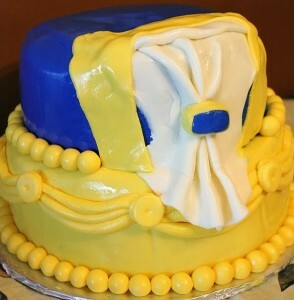 7) When working with fondant, keep any additional fondant that you are not using at the moment wrapped up or covered. It will dry out in that short time you are working with another piece. 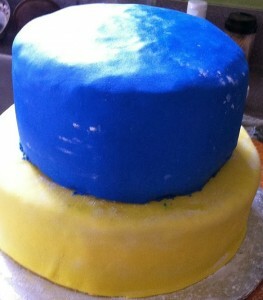 Covering the cake was a lot easier than I expected. I had some lumps and bumps from not having my undercoat completely smooth. For my test cake I used a buttercream coat and for my final cake I decided on a chocolate ganache. This is my go to chocolate cake recipe courtesy of The Paper Seed. Her recipe made enough for my ENTIRE cake which consisted of two 8 inch pans and two 6 inch pans. For my ganache I just combined advice from various blogs. I will try and post some tutorials in the future to show you how to put everything together. Honestly, this marshmallow fondant was easy to make, simple to work with, and according to everyone, it tasted delicious! I did not have any but from my past experiences with regular fondant, it can taste pretty terrible. This recipe tasted like sweet marshmallows. Just a reminder for some, since I did not even realize until more recently, that marshmallows contain gelatin. Give a heads up to your vegetarian friends when using this recipe. I used Wilton’s book pan since her 1st birthday theme was a “book” theme. I will show you the guestbooks for her first and second birthday in another post. She received so many books and I could not have been happier. Now at 2 years old she is reading more than ever and expects more than 3 books a night when it comes to bedtime. And lastly, a sneak peak at my royal icing sugar cookies. I am hoping you get the Alice in Wonderland references!